Grand Theft Auto games remain one of the great playgrounds for modders, the people who hop into game code and change things around to their whim. The GTA games are big sandboxes of interlocking systems and realistic graphics, making them ideal places to insert one new, off-kilter addition to then let run amok. The most jarring thing about a good mod is how natural it looks in its new setting. 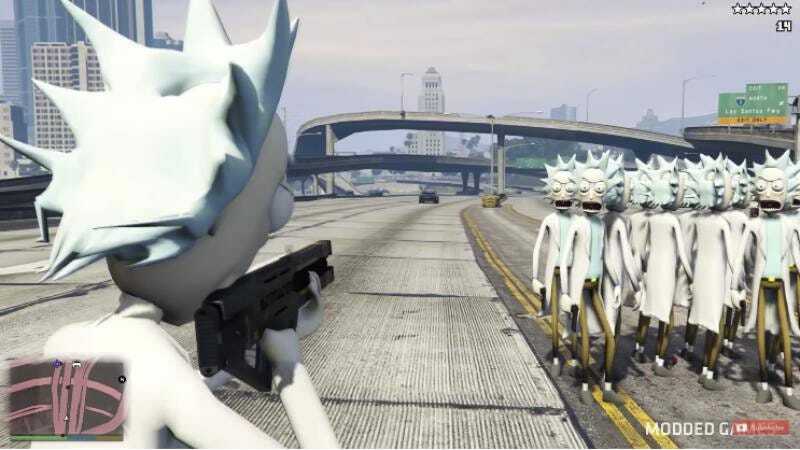 That is certainly the case with these new Rick And Morty mods, which drop the two titular characters along with their spaceship and the beloved, existentially despairing character Mr. Meeseeks into the world of Los Santos. Once there, they partake of the many beloved activities within that city—particularly stabbing policemen, shooting helicopters out of the sky, shooting people, and going to strip clubs. It’s eerie as hell. Here you can see Mr. Meeseeks despair at the meaninglessness of existence and a bunch of Mortys killing each other. It’s violent, surreal, funny, and… well, not all that different than a normal episode of the show. It’ll have to tide us over for awhile, as the rest of the third season reportedly won’t be out until much later this year.